This ain't origami and it sure isn't paper maché. Build envelope: 9.39" x 6.89" x 5.9"
Dimensions: 37.4" x 27.55" x 31.5"
Who can use paper prototypes for product design? The IRIS is well suited for visual feedback of design concepts in packaging and consumer goods. Wojciech Wawrzyniak is an Industrial Designer who manages the Australian 3D printing service bureau Williams 3D. Wojciech mentioned that Williams 3D uses the Mcor IRIS for pre-visualization of packaging, such as for blow molded bottles. He says, "package designs and stickers show up really well." He also said that any other object that is organic in shape, like a bicycle handle, kettle, computer mouse, or gaming handle all do well with the IRIS. One of the unique things about paper model is that you can "get out the sharpies and write on it". This is an excellent way to get feedback on design concepts, allowing executives to show clearly, for example, where they want a hole to go. 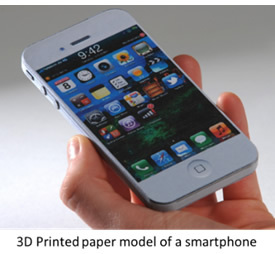 Paper models can also be molded with a rasp for quick design iterations after printing. Architects are big fans of prints from the IRIS. The relatively large build envelope is helpful, and the models can be made even larger by connecting a series of prints together to make a larger model. The Iris prints on the same letter sized paper that you buy now for your laser printer. The inks are supplied by Mcor, at a price roughly equal to regular laser printers. Wojciech said, "the cost per print on average is in the range of $2-3 per model." He estimates that the total cost to run the machine for a year including paper, ink, glue and blades will be less than $1,000. And that's running it around the clock. This makes operating an IRIS much less expensive than alternative 3D printers. Mcor says the palette is 1+M colors. You can see from the image at right that the Iris can duplicate difficult flesh tones accurately. The print resolution is also excellent, due to the fact that each piece of paper is individually cut. That makes the resolution equal to 12 microns, the thickness of a piece of standard office paper. One of the other benefits of printing with paper is that it doesn't require chemical post processing, so it's useable in an office environment. "It's so much faster and cheaper, and the prints are really pretty sturdy. They are great for display purposes and yet you can still feel good about putting one in the bin when you are done because it didn't cost much to print and it's all recyclable. If you run out of materials during a print, you can just run out to Staples and get started again. With other printers, if you run out of materials, you have to wait for a delivery from your supplier." How does a Paper-based 3D Print work? The Mcor IRIS prints onto sheets of paper using a traditional inkjet technique. Each individual page is then cut and glued into place automatically to build up the model. 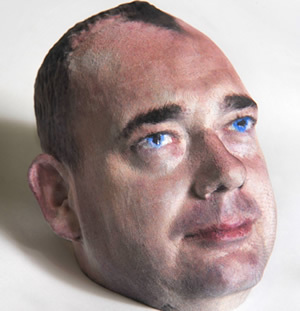 The result is a high resolution color model that is selectively laminated (high density in the area of the model and low density in the surrounding area) together with a water-based, PVA glue. Depending on the geometry and coating used, the models can be flexible, or as stiff as wood. 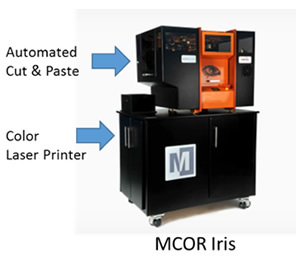 This may sound like a machine that is likely to break down or need a lot of maintenance, but the Mcor IRIS is not a new flash-in-the 3D Printing pan. Mcor has been developing their paper printing since 2005 so they've developed ways to keep the machines running. For example, the IRIS software keeps track of the distance the blades have traveled since replacement and warns when a new print will exceed the blade's life. Wojciech says that changing the blades on the Mcor IRIS is so easy, "I can do it with my feet." He added that maintenance is just changing blades and ink cartridges. Conor MacCormack, CEO of Mcor said they have built a reputation for performing well in the field. He commented that Mcor expects their first Series B financing round to close in Q1 2014, giving the company the financial support it needs to grow beyond the "hundreds of units sold in 2013". Why wouldn't you use the Mcor IRIS? The IRIS is slower than some alternative 3D printing techniques. For example, one user said that the IRIS was about 30% slower than their Fortus 400 FDM machine. Conor MacCormack from Mcor says that the company will release a new algorithm in Q1 2014 that will make the IRIS print twice as fast. If you need production parts or jigs or fixtures, the IRIS is not the right machine. If you are designing packaging or consumer products, or you want early stage visual design feedback, the IRIS is worth a look. And if you are looking for a machine for printing architectural models or for a university or college environment, the low operating cost, ease of use, and reliability should make this one of your top choices.